The objective of our assessment process is to determine the current state of each individual’s health when they arrive at St. Joseph Institute. Since our drug & alcohol addiction program is designed to help participants from a holistic perspective, the assessment addresses the physical, mental, emotional and spiritual aspects of every person. Each assessment tool helps us achieve a clearer picture of the factors that contribute to the resident’s present state, and this knowledge aids us in designing an optimum treatment plan to effectively address areas of concern. The health of the physical body is important to the overall recovery process. 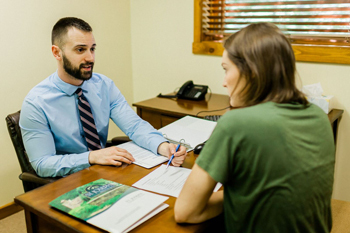 We strive to discover any underlying medical issues that need to be addressed, using a physical exam and any additional tests that may be recommended by our Medical Director. This enables us to provide proper medical care to each resident during their stay. A thorough bio-psycho-social history is taken to determine current lifestyle and historical patterns. This information is used to guide the formation of the treatment plan concerning counseling interventions that are designed to: (1) encourage change that facilitates correction and adaptation in situations that have become disruptive, stressful and unsatisfactory; (2) aid residents in learning to make healthier choices; (3) help prepare residents for predictable life events, such as the transition home after receiving treatment; and (4) keep people open to growing in new and deeper levels of understanding, appreciation and wisdom. This service is available to any resident in our drug & alcohol addiction program who suffers from neuro-musculoskeletal pain or dysfunction. It includes a Total Body Evaluation that provides a complete assessment. The physical therapist’s examination goes beyond the area of pain or complaint to look at the entire kinetic chain, revealing the source of the resident’s complaint rather than focusing exclusively on symptoms. The resident will undergo a neurological screening, muscle screening and joint testing to see if a problem in one area is contributing to, or is the result of, a problem in another area. The findings of this assessment process are used to develop the exercise components of the treatment plan for any resident with chronic pain or difficulty with movement. A holistic plan would be incomplete without a fitness component. Each resident of our program receives a comprehensive fitness assessment that includes a review of their fitness goals, medical history, previous exercise habits and exercise likes/dislikes. The intake procedure continues with a fitness assessment which includes both functional joint range of motion and sub-max cardiovascular testing. Based on this information, an individualized exercise prescription is developed.